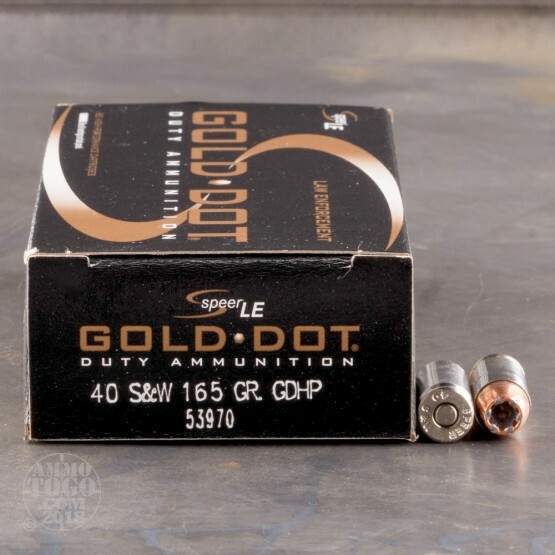 These .40 Smith and Wesson rounds from Speer's Gold Dot line are an excellent choice for concealed carry, home defense, training drills, and organized classes. 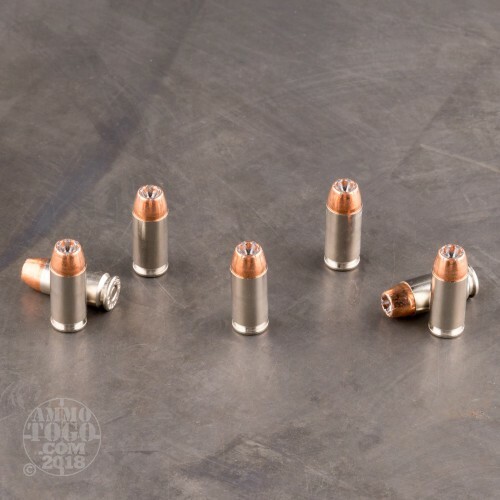 Each cartridge consists of a non-corrosive Boxer primer fitted to a reloadable brass casing which is nickel-coated for elemental protection in storage as well as smooth, reliable cycling when firing. 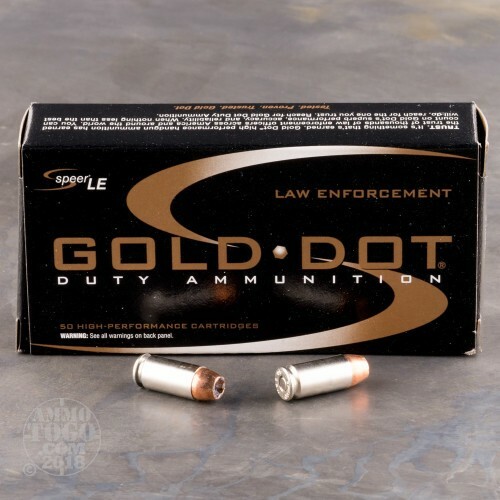 The casing contains a high-energy propellant charge that has been blended with suppressant which tames muzzle flash; this ensures that shooters won't be blinded during low-light situations and enables them to deliver faster, more accurate follow-up shots. The Gold Dot projectile used in this .40 S&W load is a jacketed hollow-point (JHP) with a deep cavity, integrated skiving, and a light weight of 165 grains. This weight is common to the caliber and yields flat trajectories, minimal felt recoil, and high impact velocities. 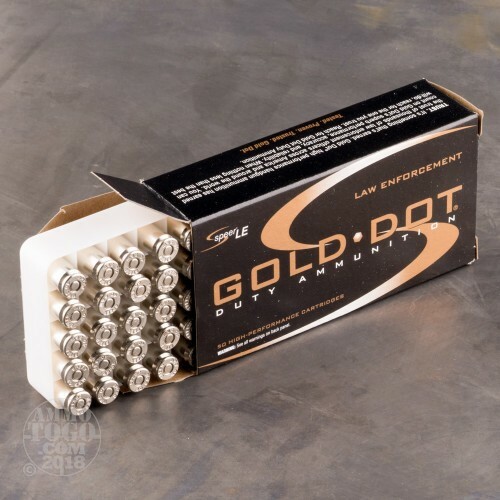 Gold Dot bullets' jackets are bonded to their lead cores via a proprietary Uni-Cor process which prevents them from separating of fragmenting prematurely. As a result, these JHPs expand reliably during entry and penetrate deep into vital zones where they deposit nearly all of their momentum in order to achieve a quicker drop on a threat. 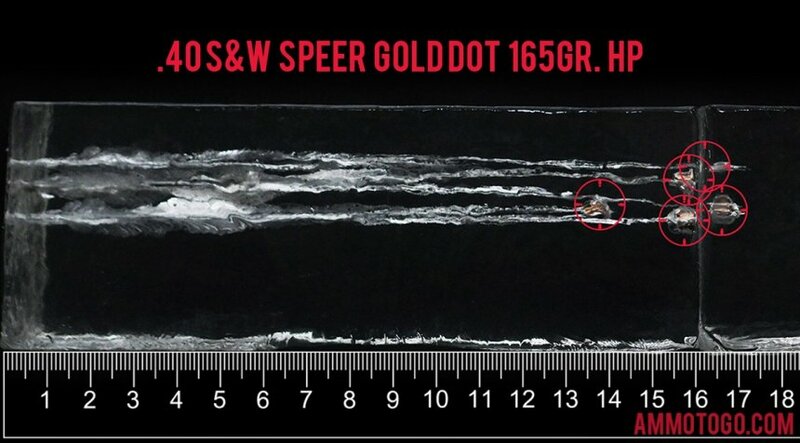 Speer ammunition is constructed using high grade components from CCI and often answers numerous training and duty contracts for federal and state level law enforcement organizations.